New Delhi : Pakistan on Wednesday sought details about the seizure of a boat and arrest of eight suspected Pakistani crew member off the Gujarat coast. 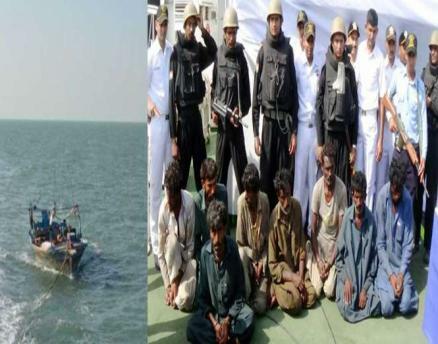 Sources said the Pakistan High Commission has formally approached the external affairs ministry to share details of the seizure of the Pakistani boat and the arrest of their crew members this past weekend as reported in the Indian media. Indian defence agencies seized a boat, with eight Pakistanis on board and carrying narcotics worth around Rs.6 billion ($95 m), in the Arabian Sea off the Gujarat coast on Monday. The vessel, fitted with sophisticated communication systems, was intercepted in international waters in a joint operation by the Indian Navy and the Indian Coast Guard (ICG). The initial investigation led to recovery of 232 packets of narcotics, suspected to be heroin and worth up to Rs.600 crore in the international market. Satellite communication phones and Global Positioning Systems, being used to facilitate trans-shipment of the contraband to another boat were also confiscated.